Meta Tags, meta description tags. In our last issue we discussed Title tags. Following on from that we can now look into Meta tags and description tags, which help funnel users to what they are looking for in search results! Meta tags were once the cheat codes for Google rankings. People once upon a time would stuff keywords into the tags and search engines would then rank those pages highly, regardless to if the content on the page was relevant to those keywords. Those days are long gone. Google and other search engines are smarter now, yet Meta tags can still play an important role in getting the benefits of whatever you are selling out to the appropriate market. “What are these meta tags?” you ask. “They provide the text under the title in search engine results” I reply. FIGURE 1: THAT'S A META DESCRIPTION THERE! PEOPLE TEND TO REFER TO THIS TEXT AS A "SNIPPET". Not only do Meta Tags provide the text, they also provide Google with an overview of what your page is about. It is important to have your keywords in the description. Meta tags do not influence Google rankings, however as the text is under the title, it will influence the behaviour of the reader. Furthermore Google will not take note of your Meta tags if it thinks they are unrelated to the content on your page and will truncate the first paragraph of your page and use that instead. So as with the aforementioned title tag, relevance is key. Meta description tags can be any length, however best practice is to keep your descriptions down to 150-160 characters long. 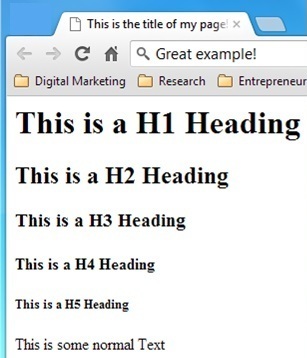 Finally, Meta descriptions will not appear on your web page at all. This is one of the reasons Google now takes no note of them as people could literally pack hundreds of keywords in and still have a nice looking webpage about something completely different. Aka, spamming! Below is what the code looks like, if you don’t have IT or developer staff to help there are hundreds of resources out there to walk you through the process related to the platform you are using. Capitals are not necessary; however they are the parts that remain constant between all Meta tags. Another type of Meta tag to note is the Meta name= “keywords” tag. Google pays no attention to this at all. Other search engines do, so it is worth putting five or six key terms related to your site. 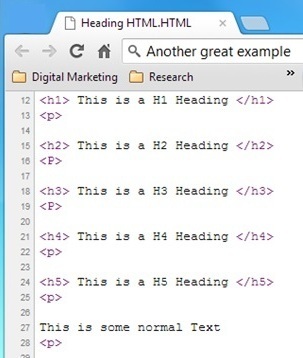 Meta tags are located in the <head> section of the HTML code. As your viewers and potential customers will likely scroll through various descriptions very quickly, try to get to the point and avoid using technical terms as much as possible. You need to allow for further questions to be asked around “will this business have the right product or service I’m looking for?” and generate a reason for following through to your page. At first it’s best to answer what you do, what you offer and stand out with your competitive advantage. Now you have a great starting point to get your pages performing! 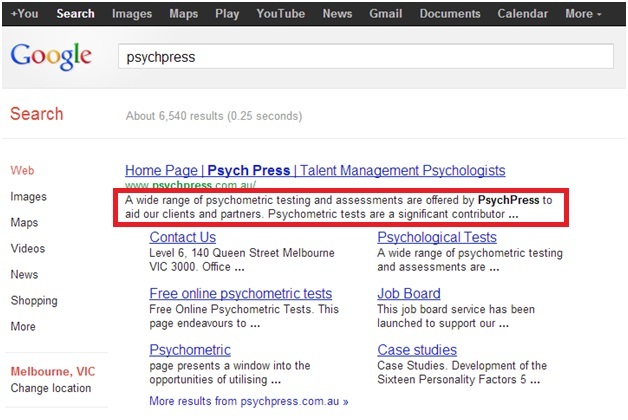 But to get real about SEO we suggest you talk to one of our specialists and email info@psychpress.com.au with an idea of your site’s objectives.